Want to know even more about the Ultragloss franchise? We want to speak to you! Call 1-330-252-9011 and speak to one of our franchise specialists. Or you can fill out the form below and view our franchise brochure. 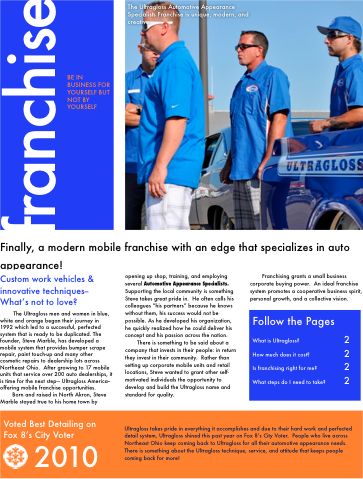 Our franchise brochure is loaded with information about our opportunity. Please take a moment and fill out the form below to gain access to our virtual franchise brochure. If you would like a hard copy of our franchise brochure make sure you provide accurate address information. The information collected is for office use only and will not be shared with any third parties.